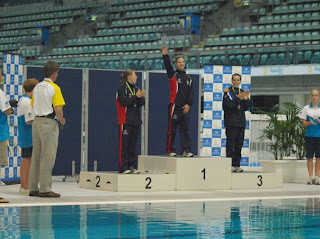 This year the National Championships were held in Sydney. Competition was over three days from the 22nd to 24th of January. National Championships are very important as the National team will be announced at the conclusion of the events, also the Australian team for the World Cup event in China. Friday the 22nd was synchro day - and I had two new synchro partners! 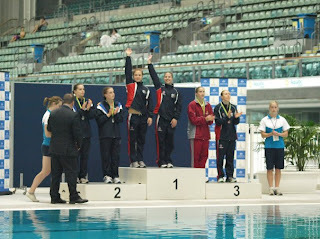 First was 3m synchro with Ashley. We dove good, especially for only training together a handful of time. We came 3rd behind, Shaz and Liv, and Hannah and Belle. Next was 10m synchro with Anabelle, we dove good too, and having only trained three times together. We were less than a point off a gold medal - frustrating. 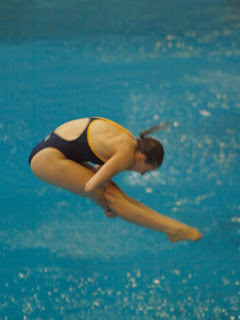 We had lots of great feedback about our synchro and I look forward to diving more synchro with Anabelle. On Saturday the 23rd I had 3m individual. There were 23 girls in the event and competition is split into prelims, semi-finals and finals - so it's a long day of competing. I dove very well in the prelims, but then semi-finals were not so good. I was pretty nervous going into finals, but I dove well to score 350 points and finish in 2nd place behind Sharleen. I was very happy with the score and theresult. On Sunday I got to hang out with dad and Rita at Darling Harbour, it was lovely and lots of fun. That night we had the Diving Australia dinner. I was announced on the Australian National Squad, Commonwealth Games Shadow Squad and a member of the Australian team for Diving World Cup in China in June. 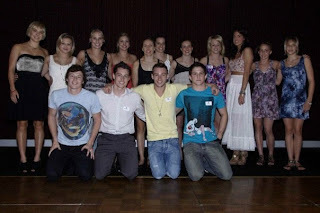 Photo on the left is of the Commonwealth Games Shadow Squad, and on the right is the 2010 National Squad.